1. 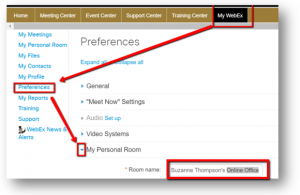 WFU faculty and staff have their own WebEx Personal Room link. Therefore, it has the same familiar interface and tools as a WebEx Meeting (not Event, Support, or Training center). 3. Does “Personal Room” sound too personal? Change it! To change the name of your Personal Room, log in at webex.wfu.edu and click the My WebEx tab at the top, Preferences on the left. 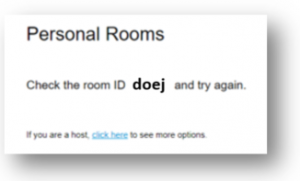 In the main content area of the page, expand the dropdown next to My Personal Room. Type in the preferred name of your room. Explore the other available settings, as well.